The late Kasey J. Ragan’s family, from left, parents Wayne and Tina Ragan, Rhett, Cori and brother, Alex Ragan, felt the time was right to end the Kasey’s Heart & Soul: Run, Walk & Roll fundraiser after the March 10 event. That is the amount raised for the Lions Camp through the Kasey’s Heart & Soul: Run, Walk & Roll in only seven years. While the dollar amount is impressive, it’s the family, volunteers, organizers and community whose numbers should really shine. It takes a community to raise a child as the saying goes; it also takes a community to remember one. The annual fundraiser came from tragedy with the loss of one of Natchitoches’ own shining stars whose young life was impacted by two summers as a counselor at the Louisiana Lions Camp. Her memory lives on in the renovations to bunkhouses and buildings, one named in her honor, and scholarships provided to 15 campers with physical disabilities. 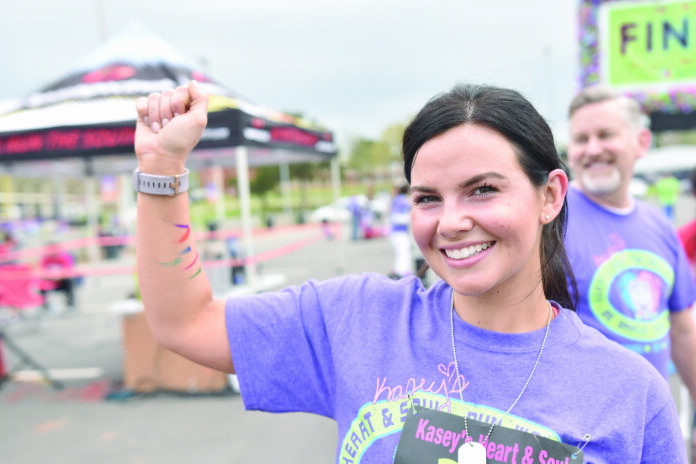 As with all things, change is imminent, and the Kasey’s Heart & Soul; Run, Walk & Roll will cease after the March 10 event this year. This T-shirt design was created by Robert Frederick with Time Box Photography for the final Kasey’s Race. Register before Feb. 23 to be guaranteed a shirt. Tina and husband Wayne are now grandparents to a wonderful toddler named Rhett who deserves more of their time and attention. That is also a factor in their decision to end Kasey’s Race. Planning began last summer and amped up over the winter to bring everything together. Co-Chair Kristi Fredieu, volunteer organizer Kelli Sampson and graphics designer Robert Frederick combined efforts to create shirts, dog tags and other items for participants. Winners in the race will also receive a canvas or poster of artwork created at Lions Camp the previous summer. All participants who cross the finish line will receive an Always. Fear(less) dog tag. “This fundraiser has been one of the most tremendous things that ever happened for us,” said Lions Camp Director Ray Cecil. Last day to register and be guaranteed a T-shirt is Feb. 23. Virtual runners (supporters who do not wish to walk or run) may also get a T-shirt for $20. Registration is also accepted the day of the event at Collin’s Pavilion on the NSU campus. Winners will receive a canvas or poster of this artwork created at Lions Camp last summer. It features Kasey’s initials as well as initials and names of others associated with the camp. •One young woman who changed so many lives and will never be forgotten.